CONSOLIDATION HAS been a decades-long trend in American banking. In the years before the financial crisis giants were formed in a dizzying series of mergers and acquisitions. But since the crisis passed, the hook-ups have been between smaller banks; the presumption has been that big deals would be blocked on competition grounds. That big-deal drought has ended. On February 7th BB&T, headquartered in Winston-Salem, North Carolina, and SunTrust, based in Atlanta, Georgia, announced that they are to merge. The new entity, valued at $66bn, will be small compared with the behemoths formed before the crisis, but vast compared with the mergers that followed. It will be America’s sixth-largest bank by assets, at $440bn, and heavily concentrated in the economically vibrant south-east of the country. Shares in both banks rose on the announcement. The record of integrations on this scale is patchy. But for investors, the prospect of a pickup in big-bank mergers is tantalising. Disastrous attempts to merge incompatible back-office systems may be a thing of the past. A handful of companies now provide the technology used by thousands of banks for processing transactions, running websites and evaluating risk. And the other ways that banks have been using to improve efficiency and therefore earnings—reducing headcount and closing marginally profitable operations—have largely run their course. The two banks say they will save 13% of costs; a plausible estimate, says Keith Horowitz, an analyst at Citigroup, since a quarter of their branches are within two miles of a branch belonging to the other. There are sure to be layoffs, though an elaborate executive transition has been worked out that appears to have pleased the occupants of the banks’ corner offices. Some operations will continue in both Winston-Salem and Atlanta, but there will be a new headquarters in Charlotte, North Carolina. The combination of regional institutions such as BB&T and SunTrust could provide a welcome boost to competition. Though America has more than 5,000 banks, the titans— Bank of America, Citigroup, JPMorgan Chase and Wells Fargo—account for a large and growing share of business. But customers, both existing and prospective, will need to be convinced that the new, bigger bank is good for them. 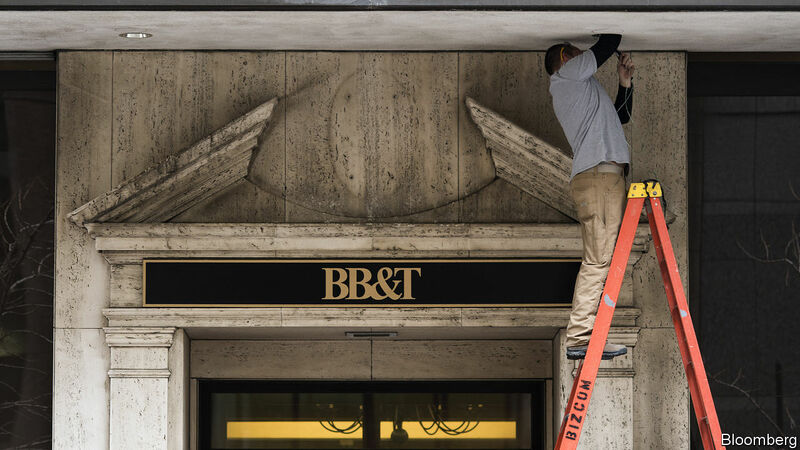 BB&T’s growth, for example, has long been fed by customers fleeing worsening service at banks that had been swallowed up by one of the giants. Come what may, this merger signals that heft is no longer a barrier to deals. Last year regulations were tweaked to lighten the burden on mid-sized institutions; the threshold at which tougher rules kicked in was raised to $250bn in assets. Both of these institutions were hovering just below the border before but have now decided to shoot past it. A return to dealmaking could also prompt the existing giants to become more daring. JPMorgan Chase, for example, has a superb retail and institutional business in America, but not abroad. The recent fashion has been for big banks to progress in baby steps. This transaction heralds a return to more audacious times. Previous PostPrevious What is it with shoe polish in Virginia?